Illustration of how the mother spacecraft Phobos Surveyor and its ‘hedgehogs’ would work. An autonomous system for exploring the solar system’s smaller members, such as moons and asteroids, could bring us closer to a human mission to Mars. Stanford researchers, in collaboration with NASA’s Jet Propulsion Laboratory and the Massachusetts Institute of Technology, have designed a robotic platform that could take space exploration to new heights. 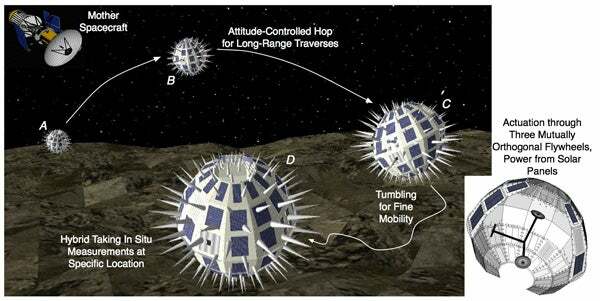 The mission proposed for the platform involves a mother spacecraft deploying one or several spiked, roughly spherical rovers to the Martian moon Phobos. Measuring about half a meter wide, each rover would hop, tumble and bound across the cratered, lopsided moon, relaying information about its origins, as well as its soil and other surface materials. Developed by Marco Pavone, an assistant professor in Stanford’s Department of Aeronautics and Astronautics, the system relies on a synergistic relationship between the mother spacecraft, known as the Phobos Surveyor, and the rovers it houses, called “hedgehogs.” The Phobos Surveyor, a coffee-table-sized vehicle flanked by two umbrella-shaped solar panels, would orbit around Phobos throughout the mission. The researchers have already constructed a prototype. Read more: Stanford researchers develop acrobatic space rovers to explore moons, asteroids — Stanford News.